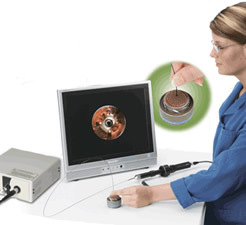 MicroFlex Flexible or Semi-Rigid borescopes use a 10,000 fiber image bundle for very good image quality in such a small diameter package. Swap the eyepiece with the supplied video adapter to use directly with a C-mount camera. MicroFlex kits include the Hawkeye SuperNOVA light source with charger and are packaged in the rugged aluminum Hawkeye Flexible Carrying Case. See cooling holes inside turbine blades. Inspect cannulas, catheters, needles, trocars, and valves in medical device manufacturing.